First off, TMG asks once again “Where are all the editors in Hollywood?” This effort is not quite as bad as the first one hour, forty-five minutes of sheer tedium and boredom of Zero Dark Thirty (2012) , but the full first half of this movie should have been scrapped and redone. Fortunately, the second half was so good it rated right up there with a KU basketball game :). Oscar talk on this film is silly and absurd with sole exception of Jennifer Lawrence for Leading Actress. Jennifer is awesome in many ways. Some billed this film as a comedy. No way. Not even close. It has a few light moments and laughs, but this is a heavy dramatic, romance all night long. Two young, romantic lost souls with OCD, bipolar, manic depressive and all around screwed up in the head, Dancing with the Stars wanna bees meet at a friends dinner party. I bet half of all Hollywood scripts on napkins start off this way. But where do you go with such a downer of a start? You wrap in parents and friends that pretend to be “normal”—whatever that is …and a therapist who clearly has deep psychosis of his own and try to write a story around football tailgaters. This movie started with the all the organization and forethought of a Carnival Cruise Line, engine room fire. I must admit, from chaos and bale loads of depression emerges a Flash Dance sort of story of romance and artistic freedom finding home. It sort of makes the case that two crazy people can find true love by finding each other. Sort of. The OCD and bipolar crowd should not get their hopes up too much. 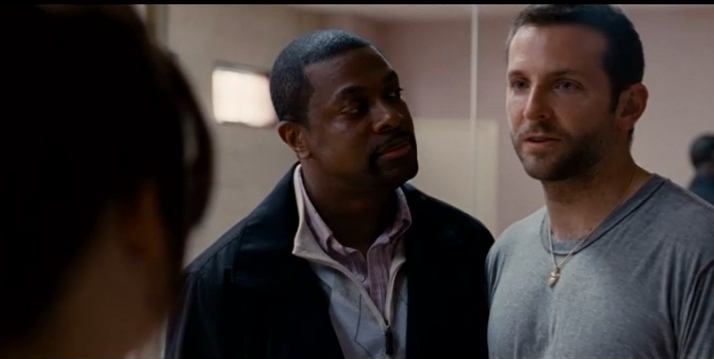 Silver Linings is decent date movie. The lesson is hang in there…dates and relationships sometimes take time to develop. I took my 89 year old mother though. She simply asked “If they like each other so much why do they use that F word so much?” Good point Mom.